Obstruction or impairment of proper drainage of the roof by debris buildup, structural “low spots”, etc. that results in leaks caused by standing water or “ponding”. Excessive walking on the roof and/or walking on the roof by persons who so improperly. Improper flashing or sealing of any roof penetrations made after the work done by Contractor has been completed (such as heating and air conditioning systems and ducts installed after Contractor’s work has been completed). Any physical damage to the roof areas that can be covered by the customer’s homeowners insurance or business risk insurance, or could have been covered by a standard homeowner’s or business risk insurance policy. All siding, gutters, fencing, exterior/interior painting, window installation/repair, remodels/additions, and skylight installation/repair have a workmanship warranty for 1 year only. NOTICE to OWNER: This warranty covers workmanship ONLY and EXCLUDES all materials used. The roofing materials selected are NOT covered by this workmanship warranty. Please see the manufacturer’s warranty for details about warranties on the roofing materials. Owner is hereby informed that ProBuilders USA, LLC, does not agree with or endorse the manufacturer’s warranty of the roofing materials selected by the customer. Consequently, the Contractor shall not be held in any way responsible or liable for any defects in the roofing materials. This workmanship warranty gives you specific legal rights, and you may also have other rights which vary from state to state. 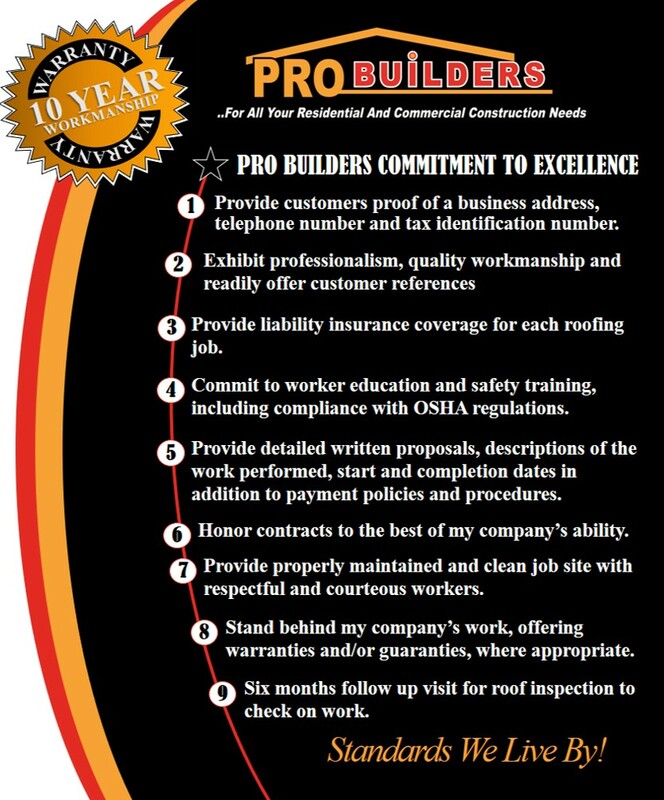 This workmanship warranty applies to ProBuilders USA, LLC, repairs and or replacement only.